020. ERNEST H. SHACKLETON. Issued in the UK by J. A. Pattreiouex Ltd. (1929). It is card number 50 from a set of 50 cards entitled "Builders of the British Empire". The card was issued as a free premium with packages of 10 "Trawler" or "Critic" cigarettes. 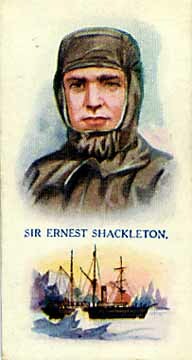 Size: 2.7" x 1.45"
Recto: A head-and-shoulders color drawing of Shackleton in sledging clothes above a depiction of a three-masted sailing ship, possibly Nimrod or Endurance. Between the two is a caption: Sir Ernest Shackleton.